Spaghetti was my jam back in the day. In fact, I had a childhood photo stuffing my face with spaghetti on the kitchen table that I still cherish. So even at a young age, spaghetti was a favorite dish. These days, I tend to cook gluten free pasta for myself and regular pasta for my boys. My husband is pretty amazing because he loves to help out in the kitchen during our spaghetti dinners. However, it's quite a production with all the pots and pans and baking sheets used to make our beloved spaghetti. One pot for pasta (which takes forever to get boiling). One pot for sauce. If you ask me, it's one pot too many! Enter the Instant Pot. I now love spaghetti nights even more because everything can be made in it! I usually like to prepare for our spaghetti dinners with a big pot of bolognese sauce. This is my favorite sauce because its loaded with ground chuck, finely diced carrots, celery, onions and garlic and a myriad of seasonings. Everything gets cooked in the Instant Pot and the result is enough sauce for several pasta dinners. But even after the pasta sauce is made, we love how we can toss in dried spaghetti, a few cups of sauce, a few cups of water, seal the lid and minutes later, dinner is ready. Below is the recipe for my go-to bolognese sauce to make in the Instant Pot and how to make One Pot Spaghetti Bolognese immediately following. If you would rather use a Slow Cooker, you can get the Slow Cooker recipe version here! Press SAUTE and add oil. When hot, add onions, garlic, carrots, and celery cooking until softened. Add the tomato paste, wine, oregano, thyme, bay leaf, 1 teaspoon salt, ¼ teaspoon pepper and sugar. Add meatballs and stir to combine. Prepare the spaghetti according to package directions just prior to serving. 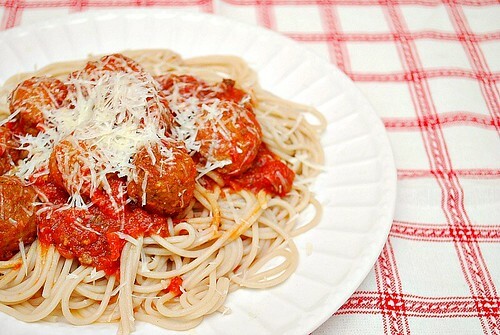 Serve bolognese sauce over spaghetti as is or with meatballs. Garnish with freshly grated Parmesan cheese. * This makes a nice amount to use and jar up for future meals. Alternatively, you can cook this prepared sauce (or any other jarred sauce) and spaghetti noodles together for a true one pot meal. Add dry pasta, pasta sauce and water. Stir to combine. Ensure pasta is covered entirely with liquid. If not, add enough water to cover. When the IP beeps after pressure cooking for 6 minutes, place a kitchen towel on top of the setting knob and carefully turn the setting on top of your IP to VENTING. Doing so allows the IP to quickly release pressure (also known as QRP or QR). Note - it may get messy, which is why I use a kitchen towel over the setting to reduce spray from the IP. I also use a wooden spoon to carefully turn the setting to avoid close contact with the potential steam. You may also want to turn your IP away from cabinets to allow the released steam to escape freely. The pin at the top of your IP will drop when all pressure has been released and it's safe to open. Serve and garnish with freshly grated Parmesan cheese.